One of those blissful days, gorgeous from beginning to end, there was only one place I was ever going to be. Admittedly we were a little late, blame that on the superb David Bowie documentary, Five Years on BBC Two that kept us up too late last night. A quick pit stop at the garden centre to pick up slug pellets and we were on site by eleven. It was the plant swap in aid of Macmillan Cancer Support today and plenty of people were there to support it. We gave some cucumber Marketmore, sweetcorn Swift F1, some pumpkin Hundredweight and chilli Joe’s Long after which it was time to sow some more seeds. Watercress – No variety given, last year we used Franchi which were very good, this time these from Thompson & Morgan. Pea – Rondo, as with the Telfono and Meteor these are planted in bags for shoots. Sweet Peas – Cupid Pink from Sarah Raven, this is a dwarf variety that doesn’t need staking but will ‘tumble’ so pretty in a terracotta pot perhaps. Sunflower – Vanilla Ice, small pale yellow flowers growing to 1.5 metres. Echinacea – Pallina, another variety from Sarah Raven. Nicandra physaloides – Also known as Shoo-Fly-Plant from Chiltern Seeds, these are supposed to deter white fly so they’re going in a raised bed with the kale, or at least the kale we would have had if I hadn’t left the seedlings to bake in the greenhouse. I’ll be re sowing those in the morning. The kale (if we manage to get any in the ground!) is one of my favourite vegetables, we have no problem growing it. But, the whitefly always manages to get the best of it. The weather did not help over the last two years and a reluctance to spray, there has to be another way. The Shoo-Fly-Plant is the companion of choice so, lets see how they get on. Thank you David, it was looking particularly good as Dai, one of our fellow plotholders had just cut the grass, also amazing what a bit of sun does. 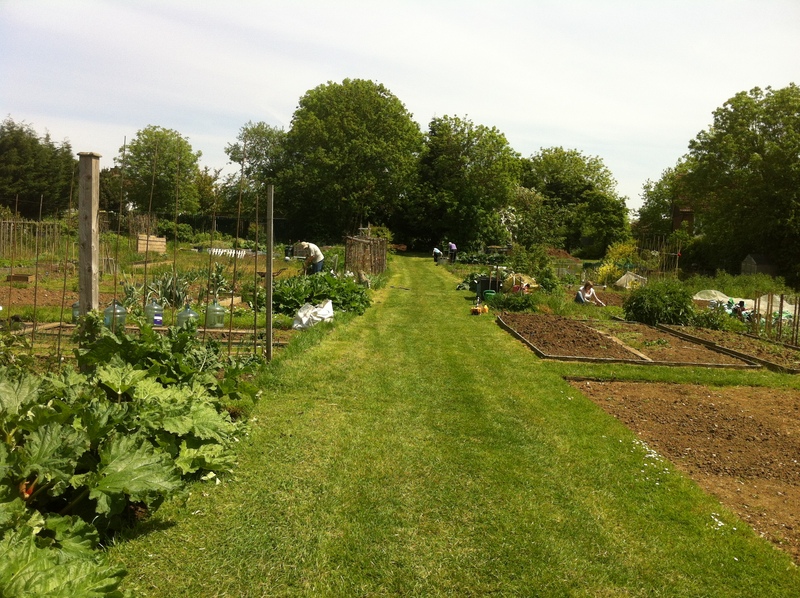 We do have a slight slope across the plot so as you look from left to right on the photo but nothing significant.